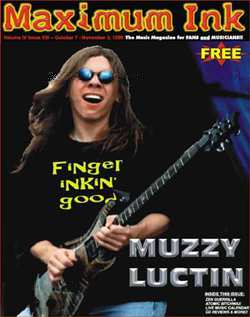 Even though they have only been together a short time, Muzzy Luctin already has enough history for a VH-1, “Behind the Music.” It’s been ten years since Muzzy Luctin’s guitar Paul Schluter kicked out the jams with Last Crack’s, Sinister Funkhouse #17, a wild rampage of hard rock boogie that brought the band legions of fans and a promising future. Promises being what they are, Last Crack disintegrated before national fame came calling, but the future arrived regardless and brought with it post-Crack bands White Chain , Spiritus, Mind Ox and ultimately Magic 7 a three quarters reforming of Last Crack halfway through the nineties. This new group took the original’s sonic squalor and added an element of eloquence, becoming steel plated shamans who moved beyond the thundering riffs into mature melodies and progressive six string slinging. Along with its members, Magic 7 brought Last Crack’s devoted following and again the future looked bright. Perhaps too bright, for before too long Schluter and vocalist and principal lyricist Buddo found themselves with a new rhythm section and the same old strains that brought Last Crack to its knees. It all came to a head at the beginning of ‘99 when time was ripe for a change. The change came in the form of Ken Thrift, vocalist and songwriter for the up and coming Inner Sanctum . A casual jam between Ken and Paul brought a synergy that amazed them both at a time when Paul and Buddo’s rapport was running short on fuel. Ken also mentioned to Paul, “If I ever put another band together, I’d call it Muzzy Luctin.” At the time, these were fanciful thoughts - Inner Sanctum was well on its way up the ladder of rock and roll success. But just as the public is fed the myths of overnight success, break-ups and catastrophe happen just as quickly and no sooner was Inner Sanctum headed for the top than it became another page in music history. Coincidentally, at the same time the friction between Buddo and Paul shifted into overdrive and before anyone could say “David Lee Roth ,” Magic 7 and Inner Sanctum collapsed and Muzzy Luctin became a reality. With Magic 7’s bassist Darren Solderholm and drummer Mike Hafner along for the ride and Ken as vocalist and songwriting partner, Paul Schluter is one happy man. He calls his last days with Buddo as a marriage of convenience, a working relationship without passion. With Ken, Paul feels the group has been unified and he’s excited about the new direction Ken brings to the group. “Muzzy Luctin will be more song-oriented,” he says, “something Inner Sanctum really put across.” They already have ten songs done with five in the can. Paul’s job as engineer and producer at Sleepless Nights Studio gives them untold advantage in pursuing their dream. “Our song for the upcoming JJO compilation, “Sugar Fly”, was done on 64 tracks and completely processed through the computer. If I come in the next day and want to mess with the guitar part, it takes a few minutes to fix instead of a few hours.” There will be a lot of people interested in what it will all mean. While a few gigs over the summer have given them some exposure, it is nothing in comparison to what’s up ahead. From a JJO sponsored release party at Regent Street Retreat on the 8th to a romp and stomp at Waunakee’s Haus Brau on the 30th, October is the month Muzzy Luctin will be hard to miss. Not that this super primed outfit could stay secret for very long; with their history of blistering, buzzcock blasts of musical mayhem and industrial strength, rock ‘n’ roll razzle dazzle, it was only a matter of time before Paul, Darren, Mike and Ken pulled it all together and struck gold. In case you were wondering, the band made a list of a hundred names before settling on the name Ken mentioned to Paul in that chance encounter. It’s made up, according to Paul, but they later found out Muzzy was slang for willing and a number of people thought Luctin sounded like reluctant, without the re, so the band took it to mean its opposite. Dazed but willing, Muzzy Luctin thought that pretty much summed it up.